Gov. Imee Marcos who runs for Senator joins the ribbon cutting of Consumer’s Welfare Week 2018 at the Makati City Hall. She hails the leadership of Mayor Abby Binay and her Vice Mayor Monique Lagdameo. Marcos explains that there’s not much difference in managing a progressive commercial district compared to being a governor in a small province in terms of public service. However, it is obvious that the city has more funds and her territory only has a larger area. She also jokes about the Yabuts, the good and the bad. 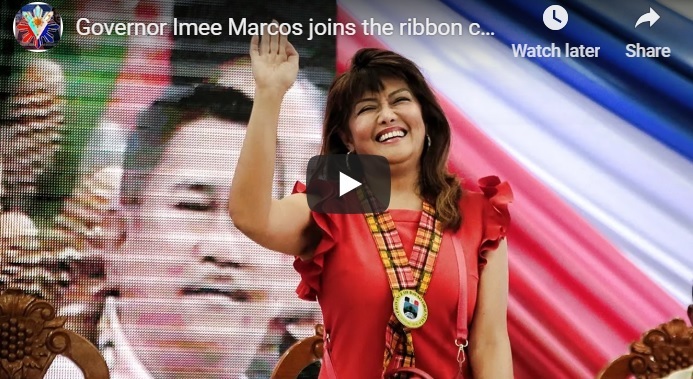 [VIDEO]: Governor Imee Marcos joins the ribbon cutting of Consumer’s Welfare Week 2018 at the Makati City Hall. Gov. Marcos prides herself in initiating or bringing back the Kadiwa system that allows direct trade from the producers themselves to the direct consumers. This eliminates the added costs of the agents in between thus lowering the costs of the basic commodities. She wishes to distribute their processed meats to the city hoping that the buyers can also benefit from the affordable prices. Since her province, Ilocos Norte is a producer of vegetables and other crops, she aims to have trade relations with Makati for these raw products in a major way. Makati is no doubt the commercial district of the Philippines and a model for a successful city, she said. It would be a boost for her products to be directly distributed to this highly developed urban area. It is widely known that Marcos forges an alliance with the Hugpong political party of the President’s daughter, Davao Mayor Sara Du30. She also defends the Filipino leader by saying that there was no such thing as militarization under the Duterte administration. She points out that the military officials appointed in various government positions were no longer in active military service. It was also in the news that Gov. Marcos met with Senator Nancy Binay to thank the latter for filing a resolution for the Senate’s electoral fraud investigation during the 2016 elections. The revelations during such hearings put Bongbong Marcos in a good light. Now, she shows support to the incumbent mayor of Makati. This is despite the Binay siblings’ rivalry in the mayoral position in 2019. The situation is not really surprising because of the fact that even the Binay patriarch, former Vice President Jojo Binay is not worried about it. Eventually, one of his children would surely be elected regardless. Earlier, Mayor Abby Binay said during a forum at Malate, Manila, answering questions whether UNA will form an alliance with Mayor Du30’s Hugpong ng Pagbabago (HNP). “Historically if you look at my dad, he is always not aligned particularly with ruling parties,” she added. Nevertheless, as a supporter of Hugpong, Gov. Marcos, can definitely bridge the cooperation of the two parties by simply being friendly and cooperative with both. After all, they are only against the yellow-minded stalwarts. Supreme Court Associate Justice Alfredo Benjamin Caguioa who is currently the justice-in-charge of the Marcos-Robredo electoral case, wrote to the Supreme Court sitting as PET in a letter-memorandum about his intent to have the case unloaded from him prior to Marcos’ filing of a motion for his inhibition. He does not intend to inhibit from the case so that he may still participate in the deliberations and voting. The Presidential Electoral Tribunal has denied the request. As this happens, the Du30-Marcos merging with the Presidential daughter Mayor Sara Du3o and Gov. Imee Marcos now attract the mainstream media. The yellow news platforms even use the alliance in their negative interpretation of President Rodrigo Du3o’s plan not to quit if the questionable Vice President takes his place instead of the VP election protestant, Bongbong Marcos whom Caguiao is reportedly against of. 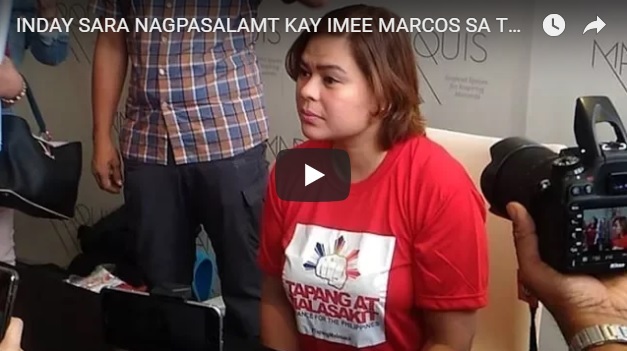 [VIDEO]: GOV IMEE MARCOS AT SEN CYNTHIA VILLAR NAKIPAGSANIB PWERSA KAY SARA DUTERTE SA HUGPONG NG PAGBABAGO! There are no changes to be made in the PET’s management. Caguioa’s plea has been denied unanimously. Furthermore, the high tribunal also says that the evidence presented to them was both internal and privileged. This could only have been accessible with unofficial means. On account of the bias of Justice Caguioa towards the yellow brigade, Marcos filed a motion. He seeks Caguioa’s recusal. Caguioa is a close friend of former President Aquino. Furthermore, Marcos also alleges that Caguioa’s wife supports Robredo actively. She had campaigned for Robredo in the 2016 elections and continues to support her cause. Now the yellow media is talking about Sara Du30. She will eventually succeed his father as some experts say. Sara Duterte right now is shoring up support for the ambitious policy agenda of his father. Furthermore, she is becoming a power-broker in her own right. The president admits that he is flagging, the yellow media said. He fears that he is hardly making a dent in tackling the illicit drugs and the corruption of the state, it added. He is being vocal that he is ready to step down and retire from the presidency. Sara Du30 had already started to expand her small party and build political alliances. She is emerging as a political juggernaut of the southern Davao region. She has served a key role in the ousting of the former lower house speaker Alvarez, as she brought together political factions. This moved is marked by the alliance between Sara Du30, and Imee Marcos. Putting in place Gloria Macapagal Arroyo as a House Speaker who is friendly to their alliance ready for election 2019. Mayor Sara Du30 Endorses Gov. 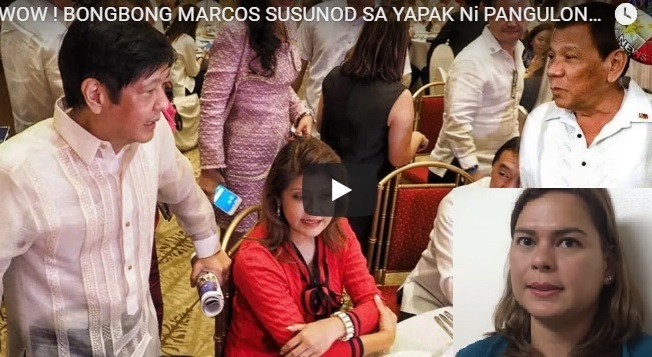 Imee Marcos for Senator while She Braises for Re-election or VP Post in 2019? 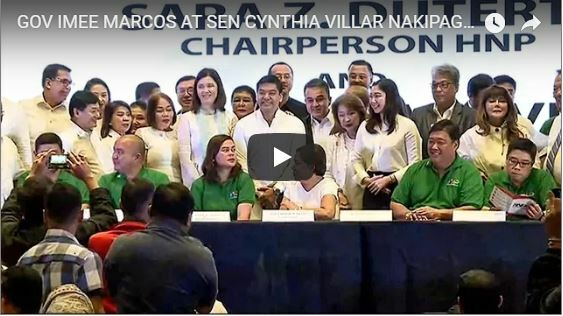 Mayor Sara endorses Ilocos Norte Gov. Imee Marcos among her other endorsements for Senator and some other officials for the senatorial slate plus local positions during the launching of the Alyansang Bol-anon para sa Kausaban (Abaka). She was the guest speaker at the event. Meanwhile, the governor is also an avid supporter of the mayor’s “Tapang at Malasakit” campaign for her new political group. Gov. Marcos is a great believer of the Marcos-Du30 tandem or vice versa. Inday Sara as the mayor is popularly known, explains to the audience that it is okay to have dissenting opinions while discussing issues internally. It is not necessary to bring them to the international front. Doing so can be detrimental to the country’s reputation. She urges politicians to settle things in the country because it’s wrong to announce disagreements to the world without solving them first. Filipinos from the different sectors can contribute a lot in making terrorism efforts insignificant just by not elaborating on them. The terrorists seek for massive media exposures to popularize what they are fighting for. Mayor Sara implies that the people must not give satisfaction to the destabilizers by ignoring their crimes and to let the authorities deal with them head-on. Mayor Sara Du30-Carpio reiterates that she has no interest in running for Senator in the May 2019 elections. “My plan is to run for mayor of Davao City for the 2019 elections,” she said. She feels that she is still effective as mayor of Davao City, which is a good neighbor to other places in the country. Mayor Sara told more than 1,000 participants of Abaka that the Senate is not for her since she is the silent type. “I feel that Davao City can help other LGUs with all the years of best practices. Davao City LGU produces relevant projects all these years. I think I can help more if I am mayor. I will ask everybody to come to Davao and look at what the local government has done for Davao City,” she added. The President is very imperfect because he is just human, said his daughter. This is quite true for all human beings who want to be true at heart. One can’t be genuine if perfection is projected. Immortals are vulnerable to life’s natural influences may it be in the manner of speaking or in expressing personal stands on various issues. As the mayor often said; experienced politicians will never announce to run for a post way before the election. Since she already announced her alleged plan, this could very well change to VP if a transitory election for Federalism pushes through. The opposition earlier expressed its fear that the Philippine President Rodrigo Du30 asks for a transitory election to extend his term. Presidential spokesperson Atty. Harry Roque disputes this by explaining that the leader even wants to cut 3 years of his term to allow the people to vote for their next head of state. Former Chief Justice Hilario Davide floats his fear that Du30 will run again with Bongbong Marcos as the Vice President. The tandem could easily win, he said. However, Marcos hints that the President is indeed true to his word that he is not into term extension. In fact, the former Senator already confirms with the media. He intends to run as President in the next election – may it be in 2019 or 2022. [VIDEO]: WOW! BONGBONG MARCOS SUSUNOD SA YAPAK Ni PANGULONG DUTERTE NA MAGING PRESIDENTE NG PILIPINAS! The namesake of the late President Ferdinand Marcos eyes to become the next president of the Philippines. The former senator said this in a media interview. He aspires to gain the highest position in Philippine politics. However, the presidency is not something that he wakes up in the morning and plans on it,’ he added. His return to Malacañang is the hope for the majority of Du30-Marcos supporters. So, if Du30 is not running, they can also do the reverse: Marcos-Du30 with Inday Sara as the running mate for VP. Davide’s fear is real. The Du30-Marcos tandem or vice versa can surely win the national election. This is because of the high approval rating of the President despite the massive destabilization efforts of his detractors. When both Marcos and Du30 loyalists merge, they certainly generate majority votes. The opposition’s near demise is now felt by their conspirators. Aside from having an unpopular head of their party elected in the executive office in the person of Leni Robredo, their forces in the other branches also dwindled. The removal of former Supreme Court Chief Justice Maria Lourdes Sereno is a demonstration of Sol. Gen. Jose Calida’s great influence. The pro and anti-Marcos senators and congressmen are still battling many issues. One thing is certain though, that the Marcos-Du30 alliance has the number to make this strategy a reality hopefully soon.